The deadline to adopt the Fourth Edition Guidelines for Assessing the Flushability of Disposable Nonwoven Products (2018) and the Labeling Code of Practice (2nd Edition 2017) is November 1, 2018. The use of flushable wipes for toileting have advanced the personal hygiene practices of millions of everyday consumers. Flushable wipes also fulfill the otherwise unmet need for superior cleanliness and convenience for the elderly and their caretakers, patients suffering from IBS or other medical conditions, medical practitioners administering to patients and parents who are potty-training. Some wipes are designed to be flushed, while others are not. For those companies who make “flushable wipes” we urge them to adopt Edition Four of the Guidelines for Assessing the Flushability of Disposable Nonwoven Products and test their products in order to substantiate flushable claims. For those making wipes that have a potential to be flushed, even though designed not to be, we encourage them to use our “Do Not Flush” symbol on packaging. 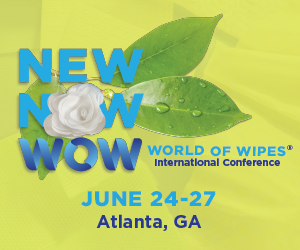 INDA, and our partner association EDANA, are committed to educating consumers on the proper disposal pathway for wipes to help reduce the amount of non-flushable material in the wastewater stream and to protect our environment. For reports, facts, and initiatives on flushable wipes and products please visit www.responsibleflushingalliance.com. For press inquiries regarding flushable wipes please visit http://www.responsibleflushingalliance.com/contact.